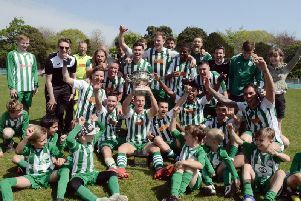 Robbie Blake was proud of his Bognor players after their perseverance paid off with an extra-time 5-3 Sussex Senior Cup win over East Grinstead. Bognor went 2-0 up then were pegged back to 2-2, but in the extra 30 minutes they scored another three to go through to the semi-finals. Bostik south-east side East Grinstead put up a great fight but ran out of steam in extra-time. Blake said he was proud of the way the depleted team kept battling to get through. See the full in-depth post-match interview above.